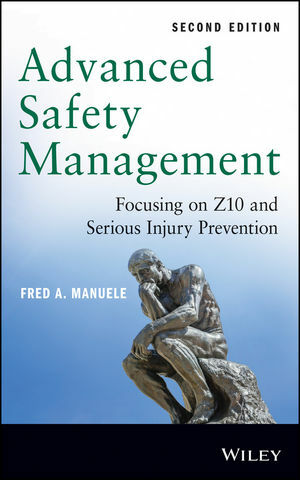 Provides guidance to managers, safety professionals, educators and students on having operational risk management systems that meet the requirements of Z10. Emphasizes Management Leadership and Employee Involvement, the most important section in Z10, with particular reference to contributions that employees can make. A new provision was added to Z10 on Risk Assessment which along with Avoidance of Human Error is addressed. FRED A. MANUELE, CSP, PE, is President of Hazards Limited, a company he formed after retiring from Marsh & McLennan, where he was a Managing Director. His experience in the practice of safety spans several decades. He is a Certified Safety Professional and a Registered Professional Engineer. Mr. Manuele was awarded the honor of Fellow by the American Society of Safety Engineers and was given the Distinguished Service to Safety award by the National Safety Council. In 2013, the Board of Certified Safety Professionals recognized his accomplishments through a Lifetime Achievement Award.